If you’re like most small business owners, you either don’t have your own warehouse or you have a warehouse that’s old-fashioned and inefficient. That means that improving your warehouse should be your next big investment. 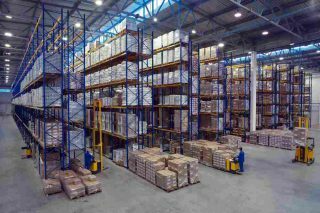 To improve your warehouse, you need to start thinking about smart warehousing. Smart warehousing is the future of e-commerce, and we’re here to tell you about it. Read on to learn the importance of having a smart warehouse. Smart warehousing is all about technology, efficiency, and automation. If your warehouse is full of employees with clipboards, taking note of everything by hand, it’s not a smart warehouse. If you’re running a small business with a modest inventory, that paper-and-pencil style might work just fine. But if you ever want to grow your business and make serious money through e-commerce, you’ll need to modernize your warehouse and join the smart warehousing revolution. So what is smart warehousing? Smart warehousing is a constellation of techniques that use technology to help your warehouse run faster and more efficiently. You don’t need to adopt every technique at once, different companies will incorporate different technologies depending on their needs. Let’s start by looking at the automation side of smart warehousing. We can divide automation into a few main areas: Customer side automation, inventory automation, and supplier side automation. In an old-fashioned warehouse, a customer orders an item online (or even by phone), and the order is sent to the warehouse manager. The manager then calls the warehouse floor to order the item; it’s a horribly slow process. In a smart warehouse, as soon as the customer orders the item, the order is sent directly to the warehouse. In a really advanced warehouse, robots might retrieve the item, but if you can’t avoid robots, don’t worry. What’s important is that the warehouse staff sees the order immediately. The order will include the item’s exact location (we’ll talk more about organization below), so an employee can quickly grab it. Then, as the item is leaving the warehouse, it will be scanned with a barcode scanner or RFID scanner. Your smart system will register that the item is leaving and send a shipping notification to the customer. When an item leaves the warehouse, your inventory will also update automatically. With a smart warehouse, you always have an accurate, up-to-date record of every item in your warehouse. This is not only useful information for you, it’s also useful for your suppliers. One of the most important rules of e-commerce is: never run out of anything. If a customer goes to your website to buy an item and it’s not there, you lose a potential sale and you upset a potential customer; it’s a lose-lose. By giving your suppliers access to your inventory, you can make sure you never run out of anything again. Instruct your suppliers that you want to immediately restock as soon as your supply gets below a certain amount. Set up your system so that they receive a notification letting them know when it’s time, and then send payment automatically. It’s important that it’s easy to find items in your warehouse. By cutting down on the time it takes your employees to find items, you’re not only making sure your customers receive their items quickly, you’re also minimizing the number of employees you need to effectively run your warehouse. There are a few different ways to approach smart organizing. One of the most efficient is the “chaotic” storage method. In the chaotic storage method, you simply place new items anywhere there’s space. It sounds crazy and disorganized, but it works. In fact, Amazon recently started using chaotic storage and they can now store twice as much inventory in the same amount of space. Chaotic storage depends on smart technology. The idea is that every item has a tag (barcode or RFID), and every location in the warehouse also has a tag. So when an employee places an item in a location, they scan both tags and the system knows exactly where the item is. Not only is this method efficient and fast, it’s also easy to learn. Rather than teaching new employees exactly how the warehouse is organized and where every item should be, you just teach them the system. Part of having a smart warehouse is making your employees more efficient. You want them to be completely plugged into your warehouse’s system. They should always have all available information with them, whether on a tablet or on a phone, and they should always have a way to add new data to the system. They should be adding data to the system using a scanner. You never want your employees to write or type. A hand-held bar code scanner works great for small to medium-sized warehouses, but if you really want an efficient system, RFID is the way to go. RFID, which stands for radio-frequency identification, is a technology that allows for quick and easy scanning. Each item will have an RFID tag and your employees will have RFID scanners. If the scanner is near the tag, it scans it. The beauty of this system is that your employees can have RFID scanners on their wrists which automatically scan items as they move them around the warehouse. This might seem like overkill, but every second counts when running a successful warehouse. You should have a small group of well-trained employees who understand your entire warehouse system. They should be able to run your warehouse alone during the slow season. Then when sales increase, hire workers through a staffing agency. If you’ve done everything right, these new employees should be able to learn your system quickly. The great thing about smart warehousing is that it makes your warehouse easier to understand, not harder. And that gives you flexibility and scalability. The advantages of smart warehouse technology are endless. If you want to compete in today’s e-commerce climate, making the switch is a must. If you’re not ready to run your own warehouse and you’re located in southern Florida, check out the warehousing services we offer. And if you have any additional questions about smart warehouses, contact us today! nextWhat Do the Best LTL Carriers Have in Common?